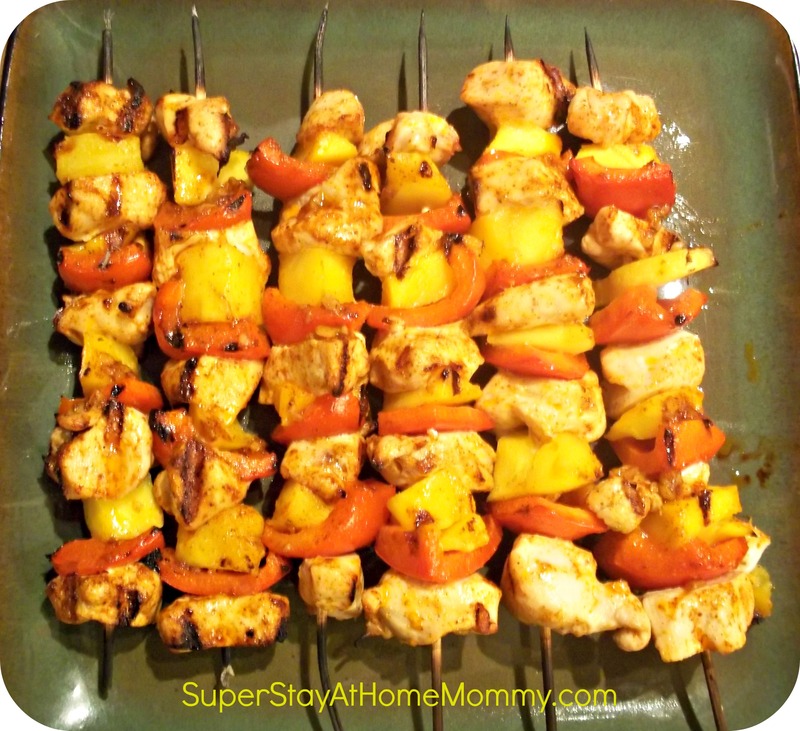 Chicken Mango Kabobs | Super Stay At Home Mommy! « Low Carb, Gluten-Free, Spinach Quiche! This whole summer has flown by in the blink of an eye!! I can’t believe it’s Fall already! But, if you’re still able to find some yummy looking mangoes at the store, then you MUST try this recipe! My husband is doing P90x and is subscribed to the email newsletters. A few weeks ago he received an email with this recipe in it, and we just had to try it. I can only describe them in one word– DELICIOUS!! They are spicy, sweet, tangy, a great mixture of flavors that will leave you craving more! Light charcoal grill or preheat gas grill. In a small bowl, create marinade by whisking together lime rind, lime juice, oil, garlic, chili powder, salt, and cayenne pepper. Place chicken chunks in large bowl. Pour half of marinade over chicken, toss to coat, and let stand for 20 minutes. Stir honey into remaining marinade, cover, and refrigerate until needed. Cut mango flesh from each side of pit. Cut mango flesh in a grid pattern of 3/4-inch squares down to but not through the skin. Gently push skin to turn inside out and cut off the flesh. Alternately thread mango, pepper, onion, and chicken pieces onto each of 8 skewers. Brush with half of the reserved honey marinade. (Discard marinade that chicken soaked in.) Lightly grease grill surface and place kabobs on it over medium-high heat; close lid and grill, turning and basting kabobs once with remaining honey marinade until fruit is softened and chicken is browned and cooked through (with no pink inside) and juices run clear (about 8 minutes). Makes 4 servings (2 skewers each). And even better, they are high in protein and low in calories and carbs. Nothing like a delicious meal that’s healthy too! **Note** Don’t forget- if you use bamboo skewers, you MUST soak them in water first! Otherwise they will catch fire on the grill… Guess who forgot to soak the skewers– yep, that would be me. Ours still turned out tasty though, our skewers where just a touch burned. lol.